The idea that the planetary motions affect and control the solar variability is old, but in the stage of an unproven hypothesis. In recent years major advancements have occurred and in 2013, it seemed that time was ripe for a major, multi-authored, reinvestigation. 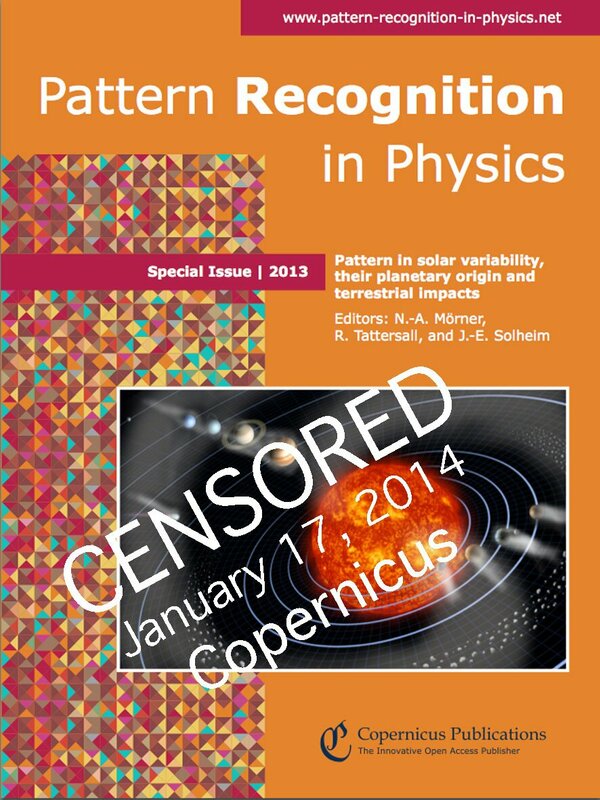 Therefore, a Special Issue of Pattern Recognition in Physics was devoted to: “Pattern in solar variability, their planetary origin and terrestrial impacts”. The volume includes 12 separate research papers and General Conclusions, co-authored by 19 prominent scientists. Indeed, they agreed that the driving factor of solar variability must emerge from the planetary beat on the Sun, and by that its emission of luminosity and Solar Wind both factors of which affect the Earth-Moon system. This may be held as a benchmark event in our understanding of the planetary-solar-terrestrial interaction. Furthermore, they noted two implications of this: partly that the old hypothesis was now lifted to a firm theory, maybe even a new paradigm, and partly that we are on our way into a new grand solar minimum which “sheds serious doubts on the issue of a continued, even accelerated, warming as claimed by the IPCC”. “We were alarmed by the second implication”, Martin Rasmussen, VD of Copernicus, stated, and took the unbelievable decision immediately to close down the entire journal. This happened on January 17 without any discussion with the editors (and with two papers in the process of being printed). By this decision, we were suddenly thrown back in the evolution of humanism and culture to the stage of inquisition and books burning. Still, the notion that we, from a planetary-solar-terrestrial interaction point of view, are on our way down into a grand solar minimum is vital in order to understand our near future: cooling, moderate warming, or accelerated warming as claimed by the IPCC, despite no temperature rise in the last 15 years. To debate is a vital part of science. To forbid and even close down a journal because of an inevitable conclusion which “sheds serious doubts on the issue of a continued, even accelerated, warming as claimed by the IPCC” is most unscientific and unethical. Copernicus has disgraced itself in this desperate act of trying to cover up for IPCC. Nils-Axel Mörner, born 1938, is the former head of the Paleogeophysics and Geodynamics department at Stockholm University. He was also president of the International Union for Quaternary Research Commission on Neotectonics. He has added around 100 peer reviewed papers to his career total of around 500 papers since he retired in 2005. I’ve read lots of stuff from NAM over the years and thought it sounded reasonable, considered and near enough as empirical as it gets with ‘climate science’, which of course is not a science at all. Only to see him pulled apart by TPTB and thoroughly discredited because he disagreed -always without recourse to rebuttal. Almost it seems a lone voice of reason then. I am so very glad to see that he is made of much sterner stuff. I cannot imagine the pressure he has been under to conform. BUT at the same time I hope he has retained his analytical and scientific method, so that if these SOBs actually end up correct for the wrong reasons, that he will man-up and say so. I rather think that would be what he’d do. Anyone who can swim against the torrent like that, has to be big enough to admit it if he’s wrong. So therefore, in the absence of any suggestion that he has actually cocked up, I expect he’s still saying global warming has sweet FA to do with carbon dioxide and doesn’t actually exist along with sea level rises as proclaimed. As to closing the mag because of this, well what do you expect in a world of doublespeak which has far surpassed Orwell’s ability to even imagine the level of manipulation of the people. I’d just like to shout out a thanks for all the messages of support we’ve had and a big hello to the three dozen new blog followers who’ve signed up for the email alerts. This fiasco will come back on the warmists. I don’t care what the politically correct say about it, planetary theory is alive and well, and makes much more sense than idiotic CAGW gibberish. It is this sort of action, sadly all too common, from the climatocrats that tells me they are cowards who know full well they are wrong. Please disseminate the links widely. I just came back from San Diego. The last night there I went for a beer up the street and, after passing by several tattoo parlours (is there REALLY that much tattooing going on to support multiple storefront parlours, or are most of them fronts for money laundering? ), I passed a converted house that served as a Psychic Counselling practice. Later, looking at a Youtube video, I watched the comedian Lewis Black ask an audience, “So, is milk good or bad for you?”, and after the silence, throw up his hands and say, “I rest my case!”. What both of these incidents (actually, the three) say to me is that we seem to have no clue anymore about what is real and what is fake, what is truth and what is lies. We find the God Particle at CERN with 21st century science the same day we check in with our dead relatives and former lives as Egyptian royalty. We look to professional researchers for advice on good eating, some of which tell us X is the best thing for us while others tell us X is why autism is “rampant” among our children. We listen to James Hansen say that it is “game over” for the planet if the tarsands are exploited and then Neil Young say, really, he is just concerned about the observance of Native treaty rights, he didn’t mean the tarsands were equivalent to Hiroshima, he’s cool with people working on the tarsands. What is the problem? Why can black be white and white, black? I’d say because we have become hostage to micro-focused academics: each looks at This, This and This (and especially NOT That or That) and makes a conclusion which we, as Stockholm Syndrome Victims, go Yes! Why? Because each one of these puts his conclusions in a way that says it is in our interests to agree. We agree because we are told these smart people work only for our greater good. Which we, as money-earners and taxpayers, pay them to do, so, golly, we sure hope they do. Including the psychics. Which doesn’t account for the number of storefront tattoo parlours, but, hey, if they pay taxes and the black money becomes white, why should I care. Especially since, I have heard it argued, ALL money is black, if not now then in the past, there is no difference, really. I quite enjoyed the papers. Unfortunately having some authors review other authors papers was used to silence serious discussion of the issues. It gave critics something to hide behind while they threw rocks. Get some more reviewers and republish. There is no such thing as bad publicity. The forbidden fruit is always the sweetest. The papers have been already published and properly peer reviewed as it happens in all other fields of science. It is very typical that when a special issue about a specific topic is made, peer reviewers are chosen also among the authors of the other papers. It would not be possible to do otherwise if the topic is very restricted. If somebody questions the findings of the papers, then he should simply show where the errors are. What I see is that nobody has pointed to any error so far. The rest is politics. Think a little bit, with the closure of the journal, critical people cannot submit comments. Perhaps the authors of PRP could prepare a list of credentialed commenters, which would include themselves, of course, but perhaps others they select who know enough physics to make intelligent comments, and of course include some with divergent views. Some of these would be invited to comment on selected articles. Their comments would be identified and would come first. The author would append his response to the comment. Other comments would be restricted. Then, to hell with the journals. It’s the electronic age. we do not have to prepare anything. Everybody can read our papers and make smart comments. In science those who do not agree with the content of a paper write comments and the authors write responses and there is a debate. This is how the thing work in science. However, Rasmessen closed the journal with an arrogant act of censorship by insulting the editors and the authors. This is not tolerable. What people should do is to write emails of protest to Rasmussen and to Copernicus and to the EGU and to journalists etc…. Thanks for your comment, Nicola, but I do think that in the coming age of free information some effort to preserve the function of peer review should be made, but in the context of a freely available web-based document which is outside of the control of vested interests. Pochas, ‘age of free information’? There’s an irony there when we’re talking about the closure of a magazine which dared to publish an alternate view. I sincerely believe that encroachment in the realms of freedom, freedom of speech and freedom of expression has been mostly subtle and mostly under the guise of protecting us, but nevertheless it is serious and progressive. Latterly it has taken to closing down and limiting internet freedom, probably as it’s the last bastion. Please tell me you were being ironic? No, I’m simply an optimist. But we’ll see. Our Solar System is presently in a “Round” of “Poker” with a fellow by the name of MR. TIME. we won’t be able to complain if we eventually loose a “round”. During these “poker sessions”, MR. TIME holds varying amounts of chips so that our concept of the principal of conservation of energy seems to fluctuate. The Solar System is very resilient and thus able to deal with the perceived fluctuations. In the limited amount of time I spent reading this document, I saw only one partial attempt to deal with this resiliency by bringing into play the separate rotational rates of the earth’s different layers.